Liam Morley had a terrific game to steer Thornhill Trojans into the BARLA National Cup final with victory over East Hull. 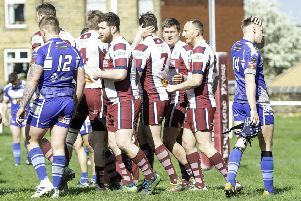 Thornhill Trojans will play in their first BARLA National Cup final after defeating East Hull 30-26 in a pulsating semi last Saturday. It was third time lucky for Thornhill following semi-final defeats to West Hull (1995) and Ideal ABI (1998). Despite a remarkable come back from East Hull the Trojans held out to book their place in their first National Cup Final. Star of the show for Thornhill was man of the match Liam Morley, who helped his side race into a 24-0 lead. Morley struck first when he followed up on a strong forward burst from Mindaugas Bendikas and took the offload to race clear and score. Sam Ratcliffe converted. Bendikas broke again and after Jake Wilson continued the move, Morley took advantage of the Thornhill pressure to plant the ball down over the line for a try. Sam Ratcliffe again added the goal. Bendikas changed roles from try creator to try scorer when he latched onto a wonderful pass from Danny Ratcliffe out to the wing and sprinted clear to score a stunning long range try, improved by Sam Ratcliffe. Thornhill continued to turn the screw and Sam Ratcliffe ran onto a short pass at speed, handing off an East Hull tackler to score a self-converted try. Thornhill looked to be firmly in control of their own destiny and there seemed little cause for concern when Clayton McCloud put Luke Whybrowe over for a try, which Clayton McCloud converted. But then East Hull scored again as Jarrod Penrose followed a high kick to go between the posts and McCloud converted. On the stroke of half time McCloud raced over for a try to the delight of the home supporters andThornhill suddenly had a game on their hands as McCloud again goaled. There were a few harsh words from Thornhill coach James Ratcliffe as he attempted to remove the complacency which had crept into Thornhill’s play. It seemed to have worked as Ryan Fenton put Sam Ratcliffe over for his second try in the corner. Andrew Bates was unable to convert but put over a crucial drop goal for Thornhill to ensure the home team needed three scores to win. East Hull hit back when McCloud ploughed under a pile of bodies to score and convert. The tension increased when Stephen Mountain took the final pass and dived over in the corner. The East Hull supporters cheered in delight. The Thornhill players protested that Mountain had dropped the ball but the referee was having none of it. In the final minute of the game the experienced Morley slotted over a drop goal to steady Thornhill’s nerves. The referee eventually blew for full time to confirm Thornhill’s place in the National Cup Final.